In a world where death, illness and aging no longer plagues the human race there has to be a way to control the population. That's where the Scythe's come in. The bringers of death, the controllers of human existence - in a way. When Scythe Faraday decides to train two apprentices he doesn't realize the uproar that will create among the Scythedom, and everyone involved gets thrown into an adventure they're not quite sure they want to be on. There are many times where I get a book by chance. 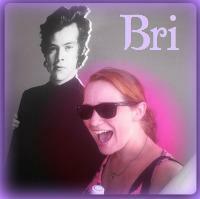 Mainly that's because my fellow blogger, Leydy, will see a book and tell me "It's a Bri book" and send it my way. So many times this happens and so many times I find a book that I absolutely love. It makes me even wonder if I really know what a Bri book is. Scythe was one of these books. I got it by chance, trusted Leydy enough to say sure I'll read it, and decided to give it a go. This book. There are so little words to describe just how much I loved it. I want to say it changed my soul - but I'm not sure how. It got into the depths of humanity, reached into the depths of my mind, and shifted my being. Scythe brings to attention the things that most people don't want to think about. Death. It is the main theme of this book. And it makes you realize how precious Death is. 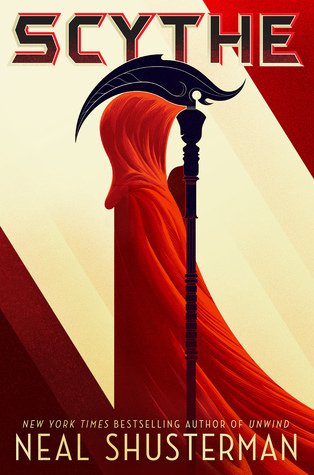 It's weird to say it, but seeing a society within Scythe that knows that Death isn't imminent, only if a Scythe declares it so, changes the whole entire way a person lives. If you live knowing that in 20 years you can "turn the corner" and go back to being 20 how would you live? Would you pursue your dreams, or would you just not care about anything. Citra and Rowan become characters you love, and you have ideals and hopes for them. They are training to be Scythe's - but only one will be able to get the Scythe position, seeing as they're training under Scythe Faraday. You want both of them to become the Scythe so badly. And when the twists and turns of storytelling bring these characters apart it tears you up. You want Citra and Rowan to be with each other. Even if not romantically, just as friends. And then, when you reach the end, you're happy about where they ended up and what happened - even if it did break you up as well. I got to the end of this book and cried. Cried because it was so good. Cried because I was heartbroken it was over. Cried because I really didn't want to leave this world, this world that makes us realize how precious our lives are even the darkest parts of it. This world will make you realize how special humanity is, how the threat of Death is really what keeps us close to one another, even to the strangers among us. It's why we are humans. This book will leave you with a feeling of hope and desire. Hope for the greater good of life, and desire to go out there and do something with this precious thing we call life. OOooh niiiiice!! I was curious about this one! I mean that cover! Totally grabbed my attention!! Glad to hear it was a good read! And one that makes you really think about things? Wow!! Though I am now scared about this ending...naturally my mind turns to the worst, since there were tears involved! ;) Great review! !